David Norman is a prominent English watercolourist who divides his time between studios in Devon and in the Dordogne. His watercolours are figurative and underpinned by a strong sense of draughtsmanship, a legacy from a rigorous training in architectural drawing and rendering. Over the years his palette has become more and more refined as he tries to simplify and justify his paintings in terms of tone and atmosphere alone. David has had many one man exhibitions and his paintings are in collections throughout Europe, America, and the Far East. 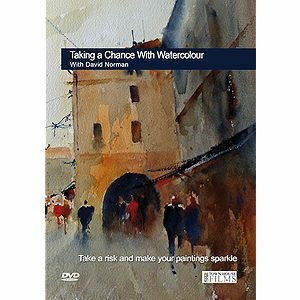 He is the author of two books on watercolour painting "The Complete Watercolourist" and "Watercolour, Artists Questions Answered" David Norman writes: Towards Narrative Painting. The inspiration for the majority of my work comes from a sometimes accidental or sudden glimpse of the subject matter whether a seascape or townscape. The time of day,the position of the sun, the weather, all have a part to play in this regard however the most important factor for me is the possibility of a story behind the image and this narrative thread stays with me and grows with the painting and, in a way, informs the outcome and influences the atmosphere of the finished work. My passion for capturing the effects of light is, I hope, obvious in the scenes of the towns and harbours which I have painted during my time spent in Europe and it is the same with the paintings completed in England, influenced by the South coast and living most of my life in Devon. It is perhaps a romantic notion but imagining a story within the painting I hope influences the finished work Perhaps the spectator can find their own interpretation, and weave their own story into my paintings.